Hindus are the best educated religious group in the United States. They are followed by Jews in the second place and Muslims at number 3, according to Pew Research. However, both Hindus and Muslims are at the bottom in terms of educational attainment measured across the globe. 41% of Hindus and 36% of Muslims have had no formal schooling. Hindus have the widest gender gap in education among all religions in the world with Hindu women trailing Hindu men by 2.7 years. Jews are the second-best educated in America with 59% of them having college degrees. Then come Buddhists (47%), Muslims (39%) and Christians (25%). Jews with average of 13.4 years of schooling are the most highly educated of all major religious groups in the world, while Muslims and Hindus, with average of just 5.6 years of schooling, are the least educated, according to a Pew Research Center global demographic study. The global average schooling for the world is 7.7 years. The number of Hindus with no formal schooling is 41%, the highest of all religions. It's followed by 36% of Muslims with no schooling. Hindu women trail Hindu men in schooling by 2.7 years, the widest gender gap among all religions. The gender gap between Muslim men and women is 1.5 years while Jews have no gender gap. Pew research data clearly shows that Hindu and Muslim immigrants in the United States represent crème de la crème of the nations they have come from. They are much better educated and far more accomplished. They are in no way representative samples of the demographics of their home countries. What Drives Islamophobia in America? Muslims in Ireland are better educated on average than non-Muslims, according to new research. Ireland was one of few exceptions in Europe with Muslims completing an average of 11.8 years of schooling, or a year more than non-Muslims, the Religion and Education Around the World report by the Washington-based Pew Research Centre found. It attributes the relatively high education levels among Muslims in Ireland, the UK, Lithuania, Slovakia, Estonia, the Czech Republic and Hungary to the countries having “immigration policies favourable to highly educated migrants”. It is estimated that Ireland’s Muslim population currently stands at approximatly 70,000, of whom 2,000 are said to be doctors. In other European countries Muslims tended “to have less education, ranging from an average of 10.8 years of schooling in Georgia to a continent-wide low of 5.8 years in Spain, ” the study found. The biggest gap, the report says, is in Germany, where Muslims, on average, have 4.2 fewer years of schooling than non-Muslims (9.5 years v 13.7 years, respectively). In France, Muslims had 2.9 fewer years schooling less than non-Muslims while in Spain it was 3.2 years less. Many such European countries, the study found, had “experienced large inflows of Muslim refugees or guest workers in recent decades”. Overall, it found that “Jews are more highly educated than any other major religious group around the world, while Muslims and Hindus tend to have the fewest years of formal schooling”. Christians “ who make up the world’s largest religious group at 2.2 billion people” had 9.3 years of schooling, on average, worldwide making them “one of the world’s most highly educated religious groups”. 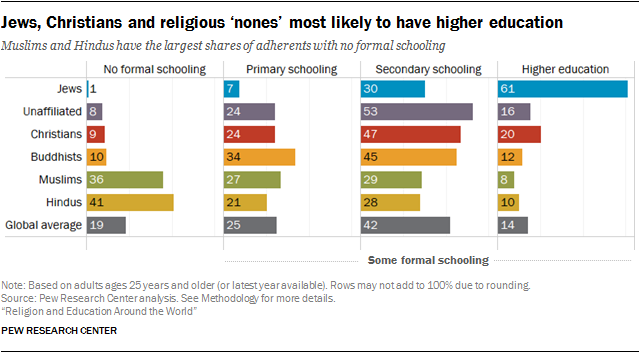 Among the world’s major religious groups, Muslims have made some of the greatest gains in educational achievement in recent decades. The share of Muslim adults (ages 25 and older) with at least some formal schooling has risen by 25 percentage points in the past three generations, from fewer than half (46%) among the oldest group included in the study to seven-in-ten (72%) among the youngest. The Muslim gender gap in educational attainment worldwide also has narrowed. Nearly four-in-ten (36%) Muslim adults, however, still have no formal schooling at all. That includes 43% of all Muslim women and 30% Muslim men. At the other end of the spectrum, 8% of Muslim adults – including 10% of Muslim men and 6% of Muslim women – have a post-secondary education. Pakistan is the fourth biggest country to provide doctors to United States and at present 12000 Pakistani physicians and specialist doctors are working in different states. It is expected that in near future Pakistan will become the third biggest country to provide doctors who fulfill the demand for international doctors in the USA, says a press release. This was informed during a visit of a delegation led by Dr. Humayun J. Chaudhry President and Chief Executive Officer of Federation of State Medical Boards of United States to offices of Pakistan Medical and Dental Council (PMDC) on Monday. The PMDC President along with its council members and PMDC staff welcomed the delegate. A detailed presentation of PMDC functioning was given to him by President PMDC. PMDC arranged visits for the delegate in public, private and military medical dental colleges i.e Army Medical College, Rawalpindi Medical College, CMH, Holy Family Hospital etc to brief about the medical and dental educational system of Pakistan. Meanwhile, Dr. Humayun Chaudhry also attended a seminar regarding Pakistani medical and dental curriculum and licensure in Holy Family Hospital jointly organized by PMDC and Rawalpindi Medical College. The delegate Dr. Humayun Chaudhry appreciated the system of medical and dental education in Pakistan. He said out of 12000 doctors in USA, 3100 doctors graduated from Dow University of Health Sciences, 1900 from King Edward Medical College and others from Agha Khan University and also Allama Iqbal Medical College Lahore. He apprised that the Pakistani national doctors in USA are having a very good repute and are considered the best doctors. He added that he is very impressed that Pakistan is getting more advancement in the field of medicine and system of medical dental education and its standard is at par with the west. Dr. Humayun J. Chaudhry is also the Chair-Elect of International Association of Medical Regulatory Authorities (IAMRA) which has 107 members from 47 countries including Pakistan. Since 2009 he is the President and Chief Executive officer of Federation of State Medical Boards FSMB of United States which co-owns the United States Medical Licensing Examination (USMLE). India has six doctors per 10,000 and Pakistan has eight. By comparison, the United States has 24/10,000. That hasn't stopped two American lawmakers from introducing legislation aimed at speeding up visa approval for Indian and Pakistani doctors slated to work in the US, citing shortage of physicians in the United States. The lawmakers say foreign physicians scheduled to serve their residencies at American hospitals are encountering extremely long delays in obtaining J-1 visas from US embassies in their countries, while specifically identifying India and Pakistan as catchment countries. The holdups, they said, have resulted in "major dilemmas" for those doctors and the US hospitals - many in rural and underserved communities - at which the physicians are set to work. In many instances, they said, the delays have forced hospitals to withdraw offers from foreign physicians who had already accepted. Children of Bangladeshi and Pakistani origin in Britain have outperformed other ethnic groups to achieve rapid improvements at every level of education, but are significantly less likely to be employed in managerial or professional jobs than their white counterparts, according to a study. One study quoted claims that Indian children in Britain were much more likely to complete their homework five days a week and to have access to a computer at home. Another showed higher engagement among Pakistani and Bangladeshi families.